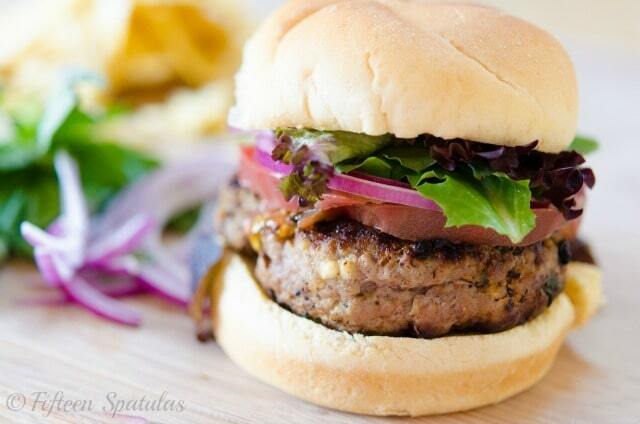 These Turkey Feta Burgers have tons of flavor and are quick to make. They’re a healthy and delicious option for a weeknight meal! Do you know what a turkey burger has that a beef burger doesn’t? A special friendliness with other flavors. A turkey burger is waaaaaayyyyyy more suited to having lots of fun ingredients added to it. I mean, put feta and basil in a beef burger, and that might be kind of weird. Put feta and basil in a turkey burger, and you get something magnificent. Put this feta basil turkey burger and a beef burger in front of me, and I might pick the turkey burger based on flavor alone. If you think turkey burgers are bland and boring, I urge you to try this recipe. The turkey meat has feta, basil, and a little secret ingredient worcestershire sauce to make it a party of flavor, and we cook it in the cast iron skillet to give it a great brown crustiness on the edges. I truly think it will change your mind about good old ground turkey and its versatility. 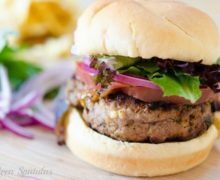 These turkey burgers can be grilled in the summer or cooked indoors all year round. For more turkey recipes, I recommend my friend Melanie’s Turkey Meatloaf, or my Baked Turkey Meatballs with Mushroom Gravy. The full recipe is below, plus a quick 3 minute video below that shows how to make it. Enjoy! 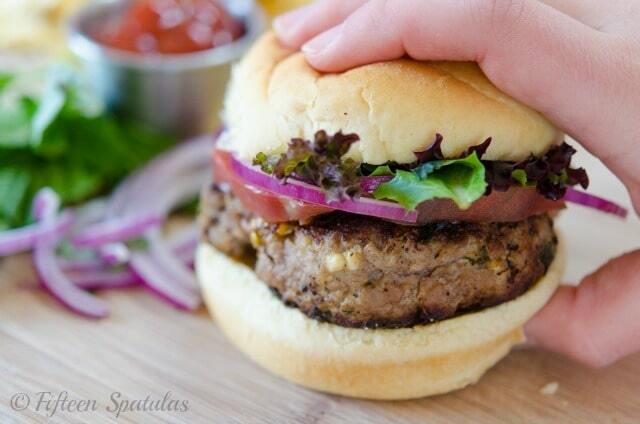 These Turkey Feta Burgers have tons of flavor and are quick to make. They're a healthy and delicious option for a weeknight meal! Using a gentle touch, mix together the ground turkey, feta crumbles, chopped basil, worcestershire sauce, salt, and pepper with your fingertips. Make sure not to overwork the meat, just distribute all the fun goodies all throughout the meat. Shape the turkey meat into 2 patties, keeping in mind that the burger will shrink up a bit after it has cooked. Don’t make the patties too thick or they’ll take too long to cook. Heat up a cast iron skillet over medium heat for a couple minutes (or if you’ve got a grill, that’d work too). Once the pan is hot, add the turkey patties and cook for about 3 minutes on each side. Time will vary depending on how hot your pan is and how thick your patties are, but you want the center of the turkey burger to read at 165 degrees F. If you find that the burgers are browning too much before the interior is cooking through, you can put a lid on the pan. Serve the turkey burgers with any accompaniments you want, and enjoy! If you don’t have a thermometer, please get one! They’re not expensive and they will make your life in the kitchen a lot easier (I own this one and it’s only $20). Are the nutirition facts based on just the turkey patty or with the bun included? It includes everything listed on the ingredients list, so yes, it includes the bun. Everything is estimated by a 3rd party company calculating everything, so only use as a rough guide.